Japanese Episode DP 141: "Tower Tycoon! That Man, Kurotsugu!!" American Episode 1236: "Challenging a Towering Figure!" The main event of the Futaba Festival has been announced - a battle tournament that ends with a chance to battle the leader of the Shin'ou Battle Frontier, Tower Tycoon Kurotsugu! Satoshi and his friends are shocked to learn that Jun's father is a Frontier Brain, but their shock is quickly turned to determination as they all decide to compete for the chance to battle. The tournament begins, and, after many tough battles, Satoshi emerges as the victor. The young trainer soon finds himself facing Kurotsugu and his massive Dosaidon. After careful consideration, Satoshi chooses to go with Hayashigame. The match begins with Satoshi's pokemon using Energy Ball, but Dosaidon's Rock Hard ability renders Hayashigame's most powerful attack all but useless. As the battle continues, Hayashigame tries a close range Energy Ball attack. However, its imprecise timing causes the pokemon to swallow the attack instead! This accident gives Satoshi's pokemon a power up and enables it to turn the tables on its massive foe. However, despite being able to pull off an impressive Rock Climb attack and delivering some damage to Kurotsugu's pokemon, Hayashigame is eventually defeated by Dosaidon. Kurotsugu is declared the winner, but he commends Satoshi on putting up such a good fight. Later, as the Futaba Festival comes to a close, Kurotsugu tells Satoshi that he should try to face the Gym Leader in Nagisa City. The next day, Satoshi and his friends say goodbye to Hikari's mother and promises to look out for each other as they head toward Suiren Town. Y'know, after the snoozefest that was the last Pokeringer episode, I was kind of apprehensive about going into another episode where an entire tournament is shown in the first half while the entire second half is devoted to a battle. Luckily, this one turned out to be pretty entertaining. The battle in the second half of the episode just clicked with me for some reason. I guess I liked how, overall, it showed how much Satoshi had grown as a trainer while still having room for improvement. Yeah, he didn't win, but he wasn't a complete pushover, either. He put up a decent fight against the Tower Tycoon, and that's something that I don't think he would have been able to do at the beginning of Diamond & Pearl. After watching this episode, I get the feeling that, with a little more training, Satoshi will be strong enough to beat Kurotsugu the next time around. His goals seem a little more within reach. I also thought that Rock Wrecker looked really, really cool. If this episode had a flaw, it was the way they reduced the tournament to a short montage. I totally understand that it was glossed over for time reasons, but if the writers aren't willing to actually show the tournament, then why even have it in the first place? Why not just have Kurotsugu accept Satoshi's challenge like just about every other major trainer in the series? Why make him go through a tournament that they apparently didn't want to bother showing? Did they want to give the false impression that Hikari, Takeshi, and Jun actually do something in this episode? 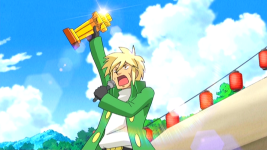 What was the point of that gold trophy when the battle with Kurotsugu was supposed to be the grand prize? The dubbed version kept a lot of the music intact, making this feel like more like an actual anime dub than most episodes, but there were a still few key pieces missing. Other than that, we get to hear more of Palmer, which thankfully isn't as horrible / overacted as the other head of the Battle Frontier was. Just like in the last episode, Jun calls Kurotsugu "Daddy" (ダディ). Barry, on the other hand, calls him "Dad." Reasons for this change could range from TPCI wanting Barry to sound less like a little kid to TPCI feeling like the word "daddy" had too many awkward connotations. Or they just felt like changing it and didn't think it would be a big deal. I would also be slacking off if I didn't mention that lifeless "Yay" from the crowd at the beginning of the episode. Was that supposed to be bad on purpose or what? James: "Yay! Hard work can pay off!" Meowth: "Nothin' like sweet nothings from a Tycoon!" Meowth: "Woo hoo! We'll make sacks of them snacks!" Originally, neither Nyasu nor Kojirou show any indication of knowing that Kurotsugu is a Tower Tycoon. As far as we know, they just think of him as just another guy. Of course, they'll figure it out when they watch his fight later, but at this point in the episode, they probably don't. By the way, those snacks that Kurotsugu's eating are called Okutan-yaki (オクタン焼き, or "grilled Octank") in the Japanese version. It sounds like takoyaki but looks more like the little baby octopuses that you sometimes see sold at various festivals in Japan. Either way, I guess Kurotsugu and the others are eating tiny, tiny Octank, maybe? Two vocal songs are moved from the dub. The first one is Battle Frontier, which plays from the start of the tournament montage and lasts pretty much until Kurotsugu calls out his Dosaidon. TPCI could have just used a longer version of their Season 9 opening (a long version exists, right? ), but they went with some bland instrumental piece instead. The second song is way at the end of the episode. The song being removed is Pokemon Ondo, only this time it's being performed by Jun. This was by far the part of the original episode that brought the biggest smile to my face, so seeing it removed from the dub was a real disappointment. I mean, yeah, I didn't honestly expect them to keep it in, but the fact that we've heard this song in the dub before gave me at least a tiny bit of hope that it would remain intact. I mean...what is that song that Barry is singing? Are we supposed to know that from somewhere? Why are the people dancing like that to this weird rock-ish song? And why didn't TPCI at least try to match the words with Barry's mouth flaps in that final shot?